Artist George Dureau is best known for his ability to portrait the beauty of the the human body. The male figure is the subject for his studies and narrative paintings in oil and charcoal and for his black-and-white photographs all created with sensitivity, compassion and passion. A major component of his body of work is his canvases. 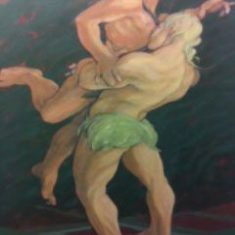 In his epic oil paintings inspired by heroic mythological characters and stories “the figures are intricately posed, inhabiting fully the picture plane, rhythmically interacting with each other. All of them tell, or at least imply, interesting, often provocative, stories.” Dureau’s work can be seen seen at the New Orleans Museum of Art, The Ogden Museum of Southern Art, Gallier Hall in New Orleans and Harrah’s New Orleans Casino, and many fine homes in our city. Frederick R Weisman Art Museum-MN Morris Museum of Art-GA and other prominent museums and collections.